The sixth year of the Festival of Film Animation took place from the 6th to 9th of December 2007 in venues of the Art Centre of Palacký University in Olomouc, Metropol Cinema, Theatre of Music and 15 minutes club. The festival was preceded by Michal Jareš's lecture on American independent comics. Animation in service of propaganda: The main thematic section introduced films of Soviet Union, United States, Poland, Great Britain and former Czechoslovakia. Dutch and Bulgarian animation: The section introduced a retrospective of two national cinematographies within blocks entitled Dutch Intoxication and Bulgarian Odyssey. Other Visions: newly as a competition section of the programme. The year's winner was Viktor Takáč, who introduced his anamnesis of Prague night life entitled Mr. Möbius Lives on the 2nd Floor (2007, 10 min). The Jury consisted of the audio visual culture theorist Gabrielle Jutz, the managing editor of Film a doba magazine Stanislav Ulver and the head of intermedia atelier of Faculty of Education, Palacký University, Vladimír Havlík. Live Animation Section offered an experimental audio visual performance and introduced "morphology" of live animation in form of several projects emerging as audio visual collage right in front of the audience – Mateřídouška, Opuka, Carpets & Curtains, Michal Mariánek and Tomáš Hrůza. Within the Live Animation Section, there was an independent project of conceptual artist Tomáš Vaněk and musician Tomáš Dvořák (Floex). The live score got an unexpected response that was being amplified by both an expressive concert of Vladimír Václavek whose music was "an object of record", and precise work by Tomáš Dvořák and Tomáš Vaněk using improvisation within the framework of scheme prepared in advance. Konvikt Resident: The aim of this new section is to complete the atmosphere by means of intensive interactive use of premises whose only purpose is to serve as a transit between projection rooms. Young audio visual artists thus got an opportunity to organize their own installation right in the centre of the festival events and to become Konvikt Residents. 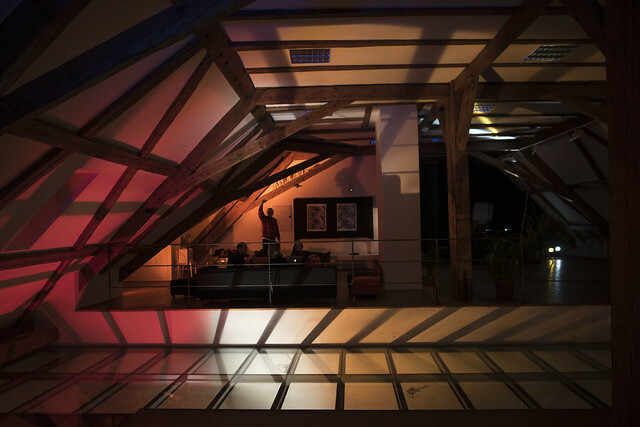 The first of them was Tomáš Moravec, a student of Dušan Záhoranský's multimedia atelier (Institute of Art and Design) at University of West Bohemia, Pilsen, who created playful projection background dependent on spatial changes in the attic of the Art Centre of Palacký University.